Norham Castle was established as a motte-and-bailey by the Bishops of Durham in the early 12th Century and within 100 years developed the stone form we see today. It was captured by James IV during the last week of August 1513 after a five day siege, and protected both the eastern end of his supply lines and the northern end of his eastern flank. The castle was also fought over during the Wars of the Roses (1455-1487) and the English Civil War and was made famous in the 19th Century through the paintings of JMW Turner. This site was first fortified by Ranulf Flambard, Prince Bishop of Durham, in 1121 to protect the Bishopric’s extensive land holdings in northern Northumberland from raids and attacks by the Scots. In the 400 years that followed the castle was regularly attacked and besieged, often withstanding the onslaught but occasionally succumbing. After falling to Scottish sieges in 1136 and 1138 the original motte-and-bailey construction stood derelict until it was rebuilt by Bishop Hugh de Piuset probably under the direction of his architect Richard of Wolviston. It was during this period that the castle began to take the form that we see today. In 1174 de Piuset supported the failed revolt against King Henry II and as a result was forced to relinquish control of the site to the Crown who garrisoned it until 1197 when it was restored to the Bishopric. Over the next 20 years the castle was well maintained and in 1217 it withstood a 40 day siege by the Scottish King Alexander II. Edward I, the ‘Hammer of the Scots’, visited the site on several occasions and in 1296 left his queen, Marguerite of France, there during his invasion of Scotland. Border warfare during the early 14th Century was almost constant but Norham was not always involved, perhaps because it was such a hard nut to crack. In 1318 Robert the Bruce besieged the castle for nearly a year eventually succeeding in occupying the outer ward. Success was short lived however as he was driven out again 3 days after breaking in. The Scots returned in 1319 and again laid siege, this time for 7 months, but again with no success. 1322 saw a third unsuccessful siege and it was not until 1327 that the castle finally fell to the Scots although the castle was again quickly relinquished when peace was declared. 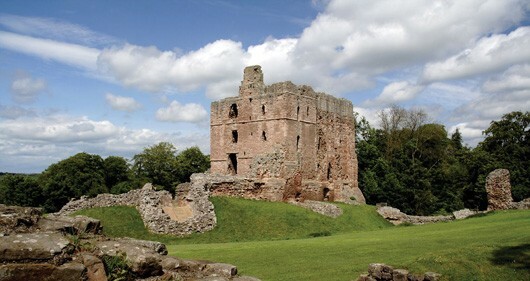 After this Norham stood peacefully for over 100 years until the Wars of the Roses (1455-1487). During 1463 the castle was held by the Yorkists on behalf of Edward IV when it was again besieged, this time for 18 days, before being relieved by outside forces. The following year the garrison changed allegiance to the Lancastrian cause but were soon forced to relinquish control of Norham to other Yorkist forces. In the last decade of the 15th Century, Bishop Richard Foxe, fearing renewed border conflict, again strengthened and updated the castle’s defences and in 1497 the castle came under the siege of James IV of Scotland for the first time. On this occasion the siege included the use of artillery in an attempt to breach the walls. Famously the 22 inch gun, Mons Meg, was brought to bear on the defences, but Norham stood firm and was eventually relieved by an English Army. Following this siege the castle was repaired, but in 1513 it again came under attack from forces of James IV, this time as part of his Flodden campaign. On this occasion James returned with artillery, as many as 20 large calibre guns (but not Mons Meg) though how many of these were used in the siege is not known. It took the Scottish army nearly a week to break down the Castle’s defences, destroying much of the outer walls. Eventually they managed to occupy the outer ward and soon the English garrison surrendered. For the last days of August and the first week of September 1513 the castle was garrisoned by a Scottish force and performed a pivotal role in James IV’s strategy for his invasion of Northumberland, securing the east end of his supply route across the Tweed and the north end of his eastern flank which stretched south to Etal and Ford Castles. Following the Scottish defeat at Flodden the castle was quickly recaptured by English forces and for the next 8 years repairs were undertaken, including modifications to allow artillery to be mounted in the site. Throughout the rest of the 16th Century it remained in good repair and was strongly garrisoned against continued border conflict. By the end of the century however, as the border became more peaceful its defences were allowed to fall into an un-maintained state and in 1596 Queen Elizabeth I refused to invest any money in further improving the site. Seven years later, in 1603, the Union of the English and Scottish Crowns under James VI/I effectively saw the end of state led border conflict and therefore the need for a strong fortification at Norham. With the exception of a short period during the English Civil War (1642-1651) when Cavaliers are said to have occupied the Castle while a force of Parliamentarians laid siege from Norham Church, the castle gradually deteriorated to the state it can be seen in today. During the 19th Century it became famous again through the work of JWM Turner who first painted the site in 1797 and in subsequent years returned to Norham as a theme many times. Today several examples of his Norham paintings can be seen in the Tate Gallery. Today the site is in the ownership of the state and the guardianship of English Heritage. Daily operations are carried out by volunteers from Norham Parish Council. The castle is sited on a hill, on the edge of high cliffs and steep slopes that lie on the southern banks of the Tweed, just to the east of the village of Norham. While the natural slopes of the Tweed valley provide protection to the north, its east side is protected by a deeply incised ravine, which may have been further enhanced by the castle’s engineers. To the south and west a broad artificial moat was excavated completing the all-round defensive circuit. Much of this now lies underneath the modern road. Within, the castle is divided into inner and outer wards, the inner ward being separated from the outer by another moat that links the ravine to the north and curves south and west around a large mound upon which the keep stands. Access through the outer walls was via a strong gatehouse in the west face and a smaller gate, known as the ‘sheep gate’, on the southern side. The remains of both can still be seen along with that of one of the outer wall’s four bastions or towers. A second surviving tower was incorporated within the small cottage built against the south side of the walls during the 19thCentury. The core of the main gate dates to the 12thCentury, although a barbican or outer work was added during the 15thCentury. Crossing the moat to the inner ward would have been via a drawbridge, now replaced with a permanent wooden structure. The inner ward stands on a mound that is likely to be the remains of the original motte that first stood on the site. Within this inner enclosure the remains of the Bishop’s Hall can be seen on the northern side and on its eastern side stands the keep which stands over 20 metres tall and was constructed during the renovations of Hugh de Piuset in the second half of the 12thCentury and then remodelled between 1422-25. Access to this building is currently limited while repairs to the masonry are made. Several other buildings can also be seen in this area including the remains of kitchens and the inner gatehouse. 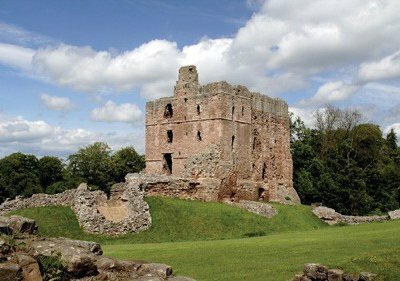 Norham Castle is a Listed Grade I building and a Scheduled Ancient Monument. Dogs allowed on leads. Picnic Area. Site Shop. Disabled Access. Victoria Hotel, Masons Arms public house, village shops and a butchers shop which has won many awards. In the English Heritage car park to the north east of the castle. From Coldstream - follow the A697 to Cornhill then take the A698 towards Berwick for 6.25 miles. Turn left and follow signs to Norham. In the centre of the village turn right onto the village green and follow the road east. Norham Castle is visible on the hill ahead of you. Pass the castle to the car park on your left. From Berwick - take the A698 towards Coldstream for 2.5 miles to Velvet Hall. There take the right turn signposted to Horncliffe and Norham Castle. As you turn the road goes between the abutments of an old railway bridge and forks. Follow the road left and continue for 2.5 miles until you see the castle on your right. Park in the car park on the right before the village.